Bruce Lee: The Celebrated Life of the Golden Dragon - Bok Lei Po Trading Inc. The first compilation of Bruce Lee photographs published in association with the Bruce Lee estate. This book reveals the full range of Lee's talents. It includes rare photos spanning from his early stage career in Hong Kong to his worldwide success as an actor and martial arts phenomenon. 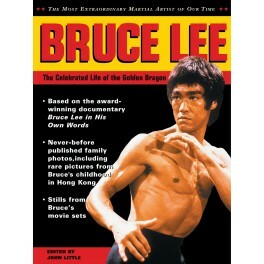 Selected with the assistance of Lee's widow, Linda Lee Cadwell, Bruce Lee expert John Little presents a photographic record, accompanied by descriptive commentary, of all facets of this fascinating man, from the start of his career to his untimely death a quarter century ago. Included are photos from Bruce's personal family photos, from his childhood years, through the early years in Hollywood, to the peak of his career as an international star. On the 60th anniversary of his birth, Lee remains a legendary figure of our time, and this comprehensive collection of photographs will be a must-have for all of Lee's millions of devoted followers. John Little is the world's preeminent authority on Bruce Lee and his work. The editor of Striking Thoughts, he is also the publisher of Bruce Lee magazine and managing editor of Knowing Is Not Enough, the official newsletter of the Jun Fan Jeet Kune Do Nucleus, as well as director of the Bruce Lee Educational Foundation.